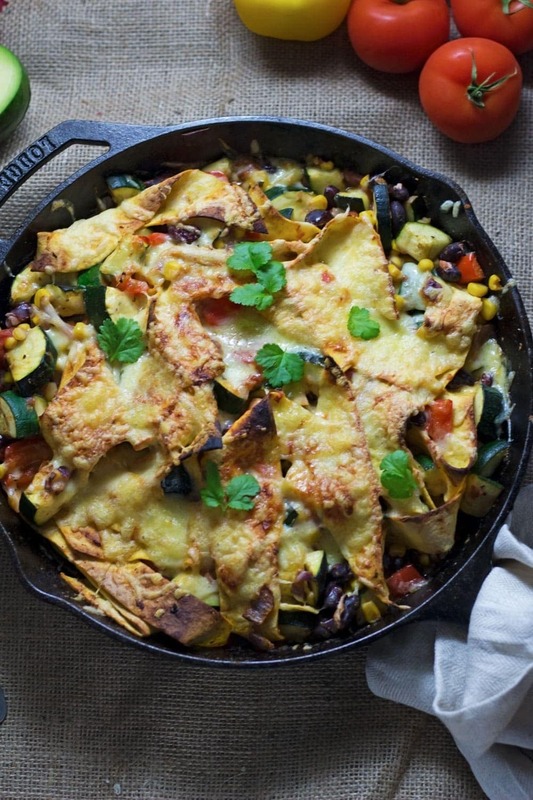 This veggie enchilada skillet is super healthy and full of spicy Mexican flavours! 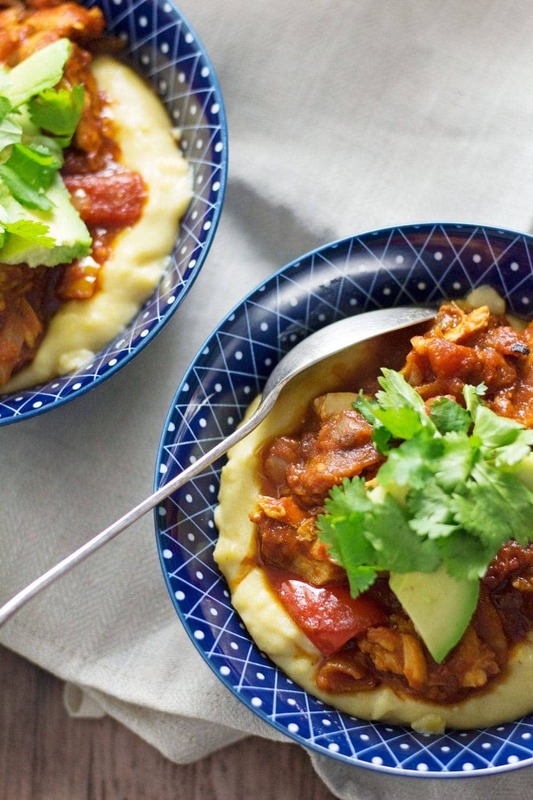 Perfect for a weeknight vegetarian dinner and great for leftovers too. Up until fairly recently I’ve always been all about the Mexican food. It would always be my first choice for favourite cuisine and enchiladas were my number one meal. My sister worked in what was probably the closest you could get to a Mexican restaurant in Birmingham when I was growing up. I remember going there for my birthday when I was a teenage and going mad on fajitas. The food was fine but I always longed for the chance for something a bit more authentic closer to home. When I was 10 we went on a family holiday to California to visit my sister who was studying there. We went to a Mexican restaurant in San Diego and it pretty much changed my life. That was the moment I realised how insane Mexican food could be. So I guess in a way it also ruined my life because I wasn’t ever going to find something like that over here. I honestly haven’t ever had anything that comes close in the UK. Anyway, I try my hardest to recreate my beloved Mexican food in my own kitchen. When I was a teenager I used to love making chicken enchiladas. These enchiladas were pretty insane. Slathered in sour cream, coated in a whole brick of melted cheese. They were delicious but probably not the healthiest of Mexican food you could find. 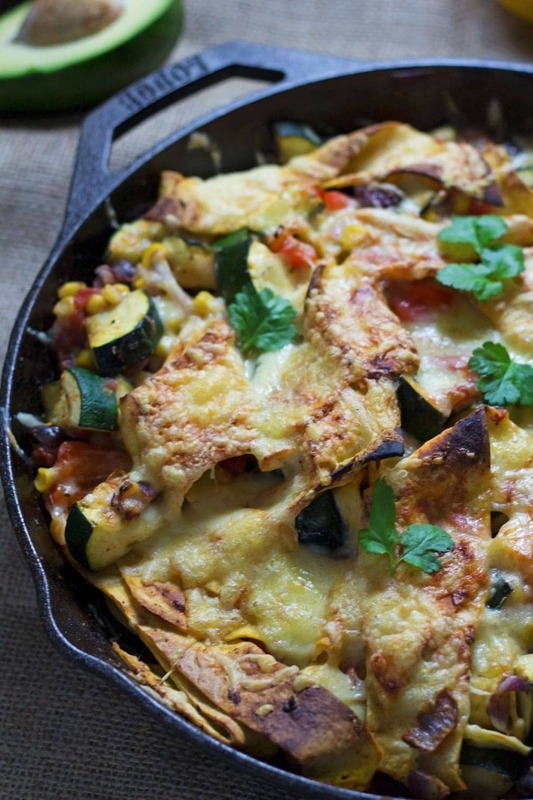 This veggie enchilada skillet is the perfect antidote to those enchiladas of my youth. Packed with vegetables, strips of corn tortillas, black beans and a simple enchilada sauce. And there’s still cheese, don’t panic. I saw the original recipe on the beautiful A Couple Cooks blog and couldn’t wait to try my own version. Most things are pretty similar I’ve just changed up the quantities and added a few extra spices to suit our tastes. 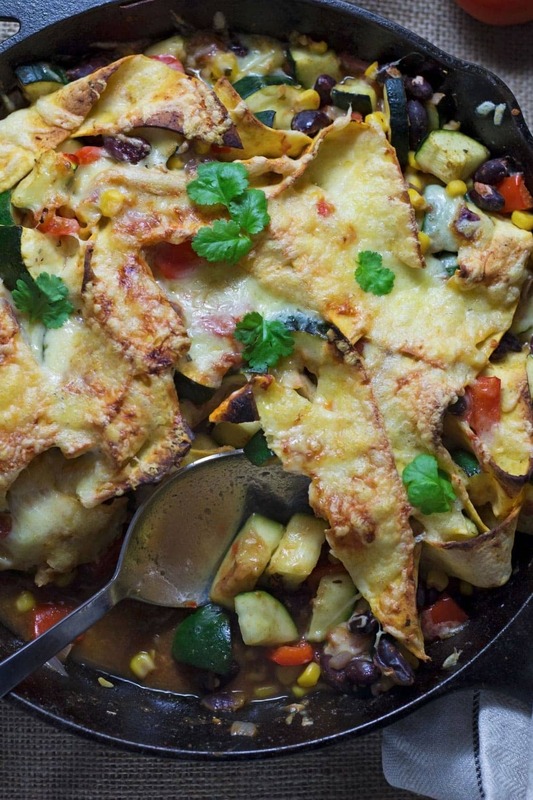 WONDERING WHAT TO DO WITH THE LEFTOVER INGREDIENTS YOU’VE GOT ONCE YOU’VE MADE THIS VEGGIE ENCHILADA SKILLET? 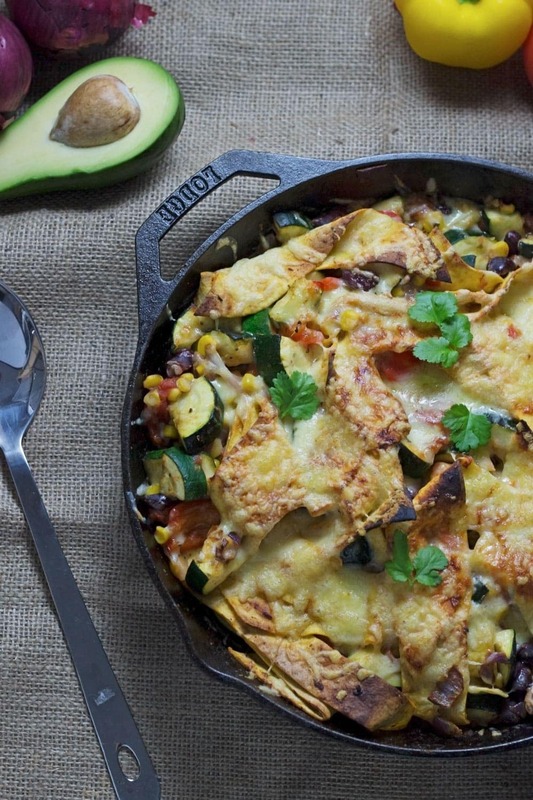 This veggie enchilada skillet is super healthy and full of spicy Mexican flavours! Perfect for a vegetarian weeknight dinner and great for leftovers too. Heat the grill to medium high. Heat the olive oil over a medium heat and add the onion. Cook for two minutes then add the garlic and cook for another 30 seconds. Add the courgette, red pepper, cumin, oregano, coriander, cayenne pepper and a good sprinkling of salt and pepper to the skillet. Cook for 5 minutes. 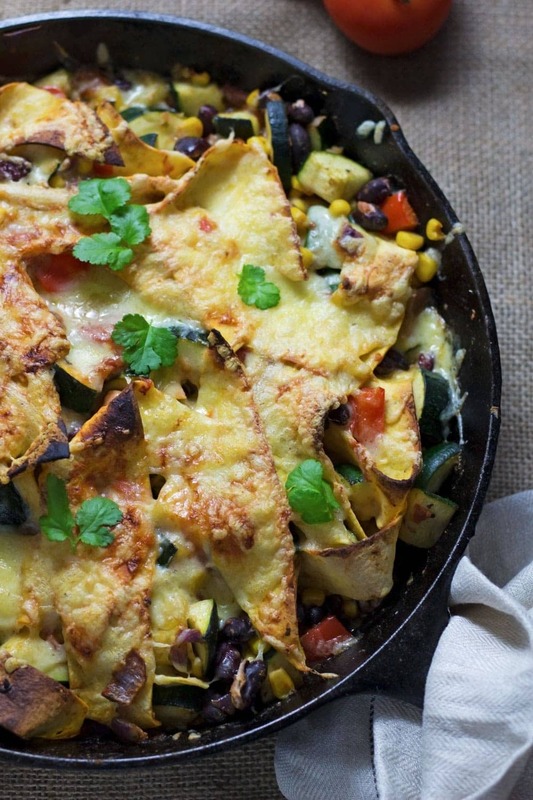 Stir in the tortilla strips, sweetcorn, black beans and passata then top with the cheese. Place under the grill until the cheese has browned to your liking. About 5 minutes. Sprinkle with the fresh coriander before serving. YUM!? Meatless has never looked SO good! This is full of color and flavor and is a must-try, for sure! Cannot wait to add this to the dinner menu! Oh man this looks lush. Almost a bit like baked nachos. I’d chuck a tonne of sour cream and jalapenos on top because I can’t get enough of them! Thanks Emma, yes, definitely love me some sour cream on top!! 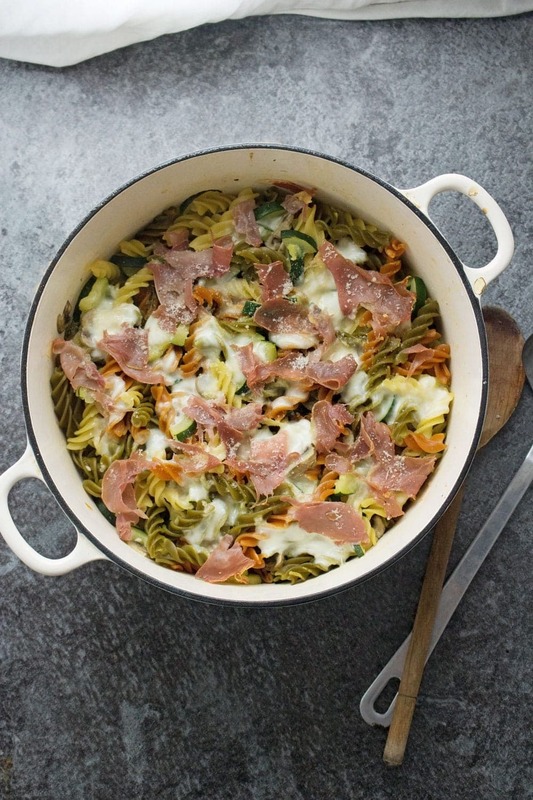 This recipe looks magnificent, so many flavours, textures and flavoursome:) I want to try asap. That sounds really tasty, Mexican food was certainly not part of my food childhood in the UK but am slowly picking up a few dishes and techniques here and there. You just kept the deliciousness in enchiladas but took the work out! Amazing! Vegetarian enchilada is something I can have for dinner every day. I absolutely love all the ingredients!